Welcome to another round of Hilarity of the Week! Come on inside to see what kind of giggles are in store today and vote for your favorite! This entry was posted in Fun & Games, Hilarity of the Week and tagged funny facebook, funny facebook comments, funny online comments, funny people on facebook, hilarity of the week, humorous comments, online comments, online humor, wifetime of happiness hilarity of the week. Bringing light reading to my blog followers is what I have set out to do. Wifetime of Happiness is a mish-mash of just nice, non controversial topics, where I hope you can find *something* of interest. 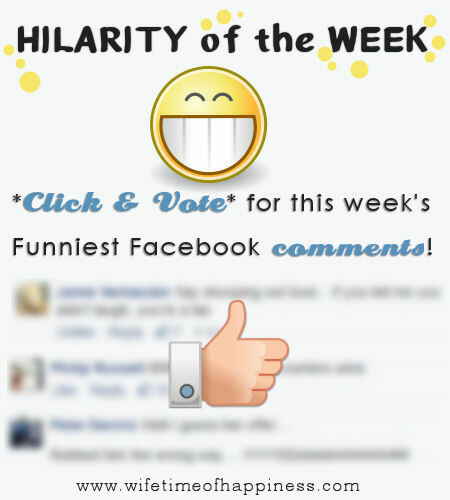 One category I have been itching to do for a while now is "Hilarity of the Week". 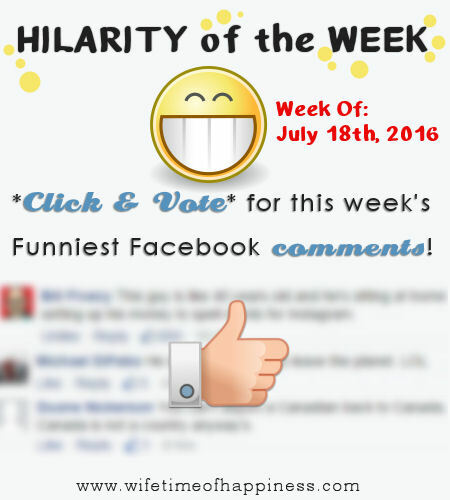 Come on inside for this week's Funny Facebook Comments! This entry was posted in Fun & Games, Hilarity of the Week, polls and tagged 50 Cent, 50 is Broke, Canada, comment poll, facebook funnies, funniest facebook comments, funny comments, funny facebook, funny facebook comments, funny polls, funny voting, funny voting poll, games for facebook, humor, humorous facebook, Is Canada a Country?, Justin Bieber, online humor, polls, ridiculous comments, shares for facebook, voting, voting polls.